This topic provides an overview of how to create custom ingest profiles for use with Context Aware Encoding. 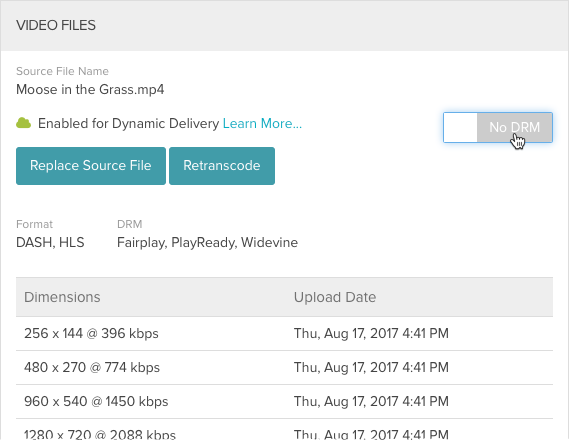 Ingest profiles contain the transcode settings that will be used when videos are uploaded using the Upload module or the Dynamic Ingest API. The ingest profile editor that is displayed will change based upon the transcoding options that have been configured for the account. Click New Profile > Context Aware. 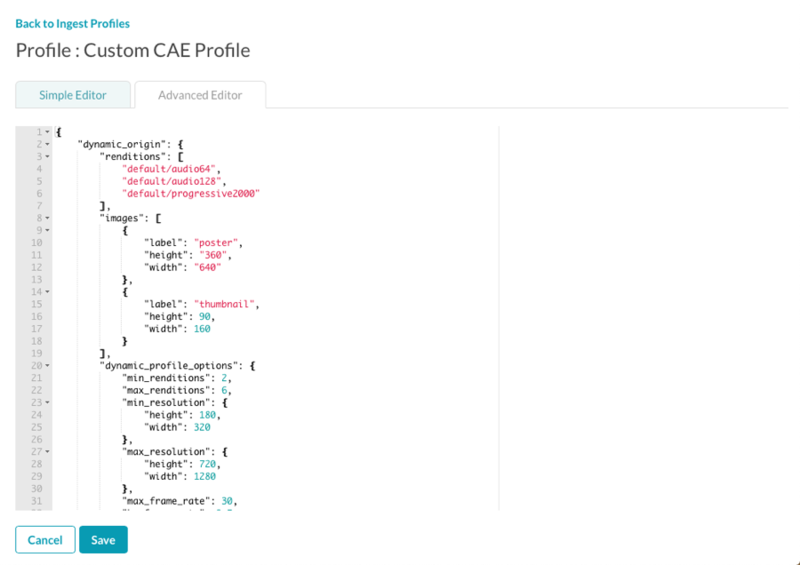 The profile editor will open. Enter a Name, Display Name and Description for the profile. Select a Minimum Resolution and Maximum Resolution by dragging the slider. This range will be used when creating renditions. Select a Maximum Bitrate. Renditions above this bit rate will not be created regardless of the complexity of the content. A lower bitrate can help control costs around storage and bandwidth. Select the Required Output Resolutions. Required resolutions will not be created if they are higher than the source file's resolution. 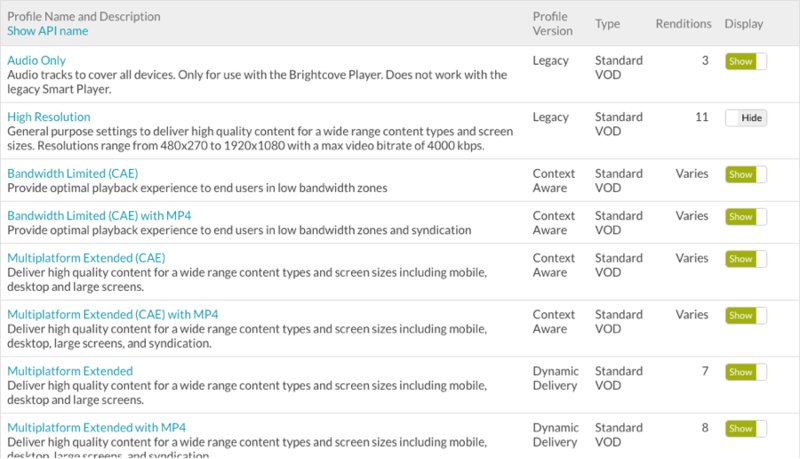 Adjust the Encoding Quality Control to adjust the video quality and bandwidth use. If you are more concerned about bandwidth usage and wish to optimize for lowest bandwidth consumption, move the slider to the left. If you are more concerned about quality and are okay with potentially using more bandwidth to deliver better picture quality, move the slider to the right. Select a Progressive MP4 Rendition to create. At least one MP4 rendition is required to post videos to social media accounts using the Social module or to allow video downloads. Select None if an MP4 rendition should not be created. Select the Audio Renditions that should be created. Note that if you require renditions with specific resolutions, it is possible to require that in the profile, but not in Studio. Instead, you will need to use the Ingest Profiles API. Note that requiring renditions is not recommended, as it decreases the efficiency of Context Aware Encoding. If you have several required resolutions, CAE may not be the right option for you. Use the Profile Editor to edit the profile name and definition. Use the Profile Editor to edit the profile definition. All Video Cloud accounts have a default ingest profile. The default profile is indicated with next to the profile name. Click Make this my default profile link at the top of the page.